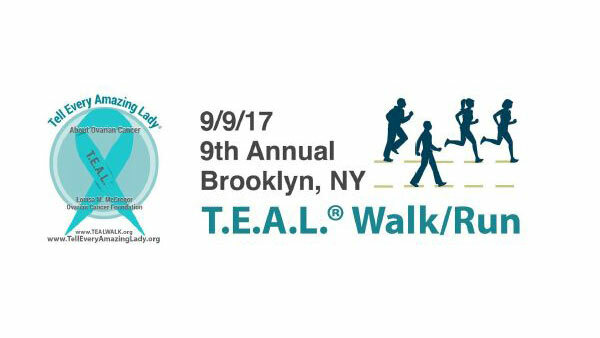 9th Annual Brooklyn T.E.A.L. Walk/5K Run for Ovarian Cancer in Prospect Park, Brooklyn! Started by two sisters in 2009, the Brooklyn T.E.A.L. Walk and 5K Run is an annual event that takes place in September during Ovarian Cancer Awareness Month. The name of this event is T.E.A.L. which stands for both Teal, the color that symbolizes Ovarian Cancer and Tell Every Amazing Lady About Ovarian Cancer Louisa M. McGregor Ovarian Cancer Foundation (the organization behind this event). Foundation also known as T.E.A.L. 9:00am - T.E.A.L. 5K Timed Run Begins! Warm-up Exercise, Important Announcements, & Special Guests! T.E.A.L. 2.5 Mile Walk Begins!